Just at the foot of Mount of Capo Graziano, there is a place where a man in late 1800 used to carve grinding stones ("macine")for mills around the island. 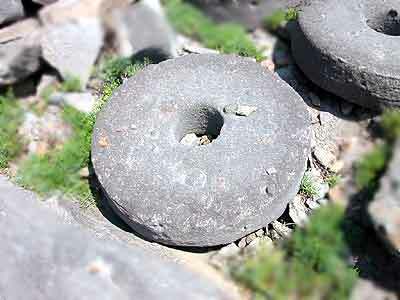 Filicudi itself at that time had 4 mills, to grind corn and other native cereals. 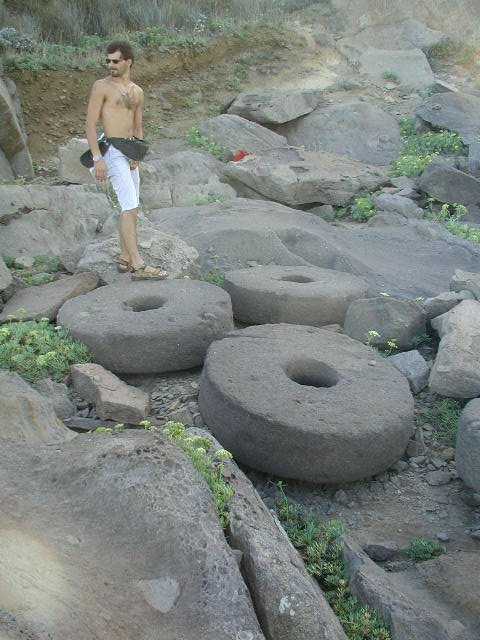 I'm not sure if they used those stones also to press olives to get oil. Those stones were let fall onto big boats. As you can see those stones are not very small... infact in depth of the sea in front of that place you can see many of those stones. I't a luck those stones are heavier than amphoras... ;-) so they'll stay all there for long. Panoramic 180° picture of the grinding stones site, in Filicudi island, in Capo Graziano.